NASA revealed its new design for its next-generation heavy-lift rocket today (Sept. 14), unveiling a giant booster that will eventually carry astronauts on future deep space missions. The new rocket, called the Space Launch System (SLS), will include hardware and technology that are legacies from the space shuttle and now-defunct Constellation programs. The $10 billion booster will use liquid hydrogen and liquid oxygen fuel, and will have solid rocket boosters for initial tests flights, agency officials said. Using liquid hydrogen and liquid oxygen fuel will enable NASA to reduce costs and leverage experience and existing technology in the field, Bolden explained. While the rocket component of the SLS is expected to cost $10 billion, the entire program (which includes work on the deep space capsule and upgrades to the agency's Kennedy Space Center launch site) will be about $18 billion through the first test flight in 2017. That's about $3 billion per year, NASA officials said. The SLS rocket's first test flight is targeted for the end of 2017, with additional flights to follow, Bolden said. The NASA chief was joined for the announcement this morning by U.S. Senators Kay Bailey Hutchison (R-Texas) and Bill Nelson (D-Fla.), who have both been steadfast SLS supporters. 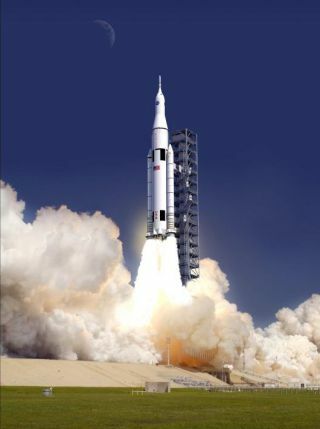 In its fully evolved state, the SLS will be the most powerful rocket, surpassing the capability of NASA's Saturn V rockets that carried astronauts to the moon during the Apollo program. The agency's planned Ares V heavy-lift rocket was slated to return spaceflyers to the moon, but the lunar-oriented Constellation program was scrapped in 2010 by the Obama administration. The SLS design includes some hardware from the Ares rocket and space shuttle, with significant technological advancements, particularly in its cores tage, Gerstenmaier said. "It's not fair to say this is really a rocket built from shuttle parts," he said. "This is really these components used in a new and novel way. It's difficult to compare rockets from one generation to the other." "This launch system will create good-paying American jobs, ensure continued U.S. leadership in space, and inspire millions around the world," Bolden said in a statement. "President Obama challenged us to be bold and dream big, and that's exactly what we are doing at NASA. While I was proud to fly on the space shuttle, kids today can now dream of one day walking on Mars." Last year, Obama challenged NASA to send astronauts to an asteroid by 2025 and on to Mars by the mid-2030s, shaping the agency's deep space exploration plan following the retirement of the 30-year space shuttle program. "This is the piece that, I believe, is going to be the true long term future," Hutchison said. "You can't have the preeminence in space that we have enjoyed over the past decades without seeing beyond the immediate term goal which, of course, is the space station, and making sure we fully utilize the space station. That is the intermediate goal. The long term goal has to be what's out there that we haven't discovered yet." The Space Launch System is a cornerstone of NASA's plan to launch a crewed space capsule on deep space missions beyond low-Earth orbit. This capsule, called the Orion Multi-Purpose Crew Vehicle (MPCV), is based heavily on initial designs for NASA's Orion spacecraft in the moon-oriented Constellation program that was canceled last year. "NASA has been making steady progress toward realizing the president's goal of deep space exploration, while doing so in a more affordable way," NASA deputy administrator Lori Garver said in a statement. "We have been driving down the costs on the Space Launch System and Orion contracts by adopting new ways of doing business and project hundreds of millions of dollars of savings each year." The huge rocket has been embroiled in controversy, and lawmakers have accused the White House and NASA of stalling on fixing the rocket's design plans and inflating budget estimates for the new booster. Last week, Hutchison and Nelson accused the Obama administration of trying to sabotage the next-generation launch vehicle by "wildly" inflating the program's cost. The accusation came after internal NASA cost estimates totaling nearly $63 billion through 2025 were leaked in a report published in The Wall Street Journal. Hutchison said the inflated figure was based on hypotheticals and did not accurately reflect the program's cost. "I think that now that the administration has come forward, everyone is on the same page on the numbers, the numbers are within the authorization levels — I think we're now moving forward as a team for America," Hutchison said. "That's where we all want it to be. Sometimes the making of the sausage isn't pretty, but I think we're on the right end."